Phil Dean, British guitarist, singer, and songwriter. His distinctive guitar style has evolved from the influences of many different genres of music. Whether it be Blues, Rock or Country. Influenced by Clapton, Jeff Beck, Buddy Guy, Albert Lee, Robben Ford, Larry Carlton. Playing guitar for Paul Middleton for seven years, Phil has an enviable amount of experience live and in the studio. In 2004 Phil played on Nige Harrison's solo album "The Long Walk Home" and performed at Nige's immensely successful album launch. A regular player in Jed's Blues Band, shows the diversity of his capabilities. 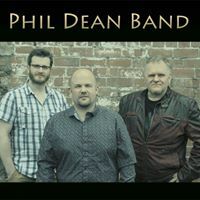 Late 2005 saw the start of a solo project, encouraged by respected musicians saw Phil taking the front man position of the band "The Fuel"
In 2007 he joined the Dan Burnett Band played at the Leeds Blues Festival and also the British Grand Prix, Silverstone with Nige Harrison. Teaming up for a project with Nige Harrison on drums and Bag on bass "The Phil Dean Trio" was formed. The band played support to Michael Schenker and Wishbone Ash.